Backers of an initiative that would give new Ventura County employees a 401(k)-style plan, rather than a pension, sometimes mention a lawsuit filed last fall by a former sheriff. 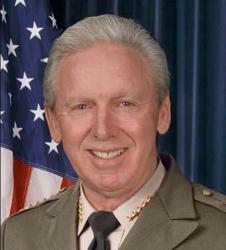 Bob Brooks, whose salary as Ventura County sheriff was $227,600 a year when he retired in January 2011, received an annual pension of $283,000. He filed a suit last September seeking an additional pension of $75,000 under a supplemental plan. If Brooks were in the California Public Employees Retirement System, his combined pension of $358,00 would be No. 2 on the current list of largest CalPERS pensions posted by a pension reform group. His total pension would top the largest California State Teachers Retirement System pension, $302,064 for a Modesto elementary school official, and the largest University of California pension, $337,346 for a UCLA retiree. In 1997 a state Supreme Court ruling in a Ventura County deputy sheriffs suit expanded the final pay used to determine pension amounts for 20 independent county systems operating under a 1937 act, ranging in size from Los Angeles to Mendocino. What became known as the “Ventura decision” said in addition to the salary, county pensions should be based on special pay received for other things, such as unused vacation time, bonuses, health care, education and car and uniform allowances. A longevity bonus for more than 30 years of service helped boost the base salary of Brooks, $227,600, to a much higher final pay total resulting in the pension of $283,000 a year, the Pacific Coast Business Times reported. His suit seeks a $75,000 supplement under a county plan, offered between 2000 and 2004, that was aimed at keeping the pensions of elected officials (ineligible for some “Ventura decision” add-ons) in line with the pensions of top appointed officials. An attorney for Brooks, Anthony Strauss, said the former sheriff was told many times before he retired that he would receive the extra benefit, and he based his retirement plans on the combined standard pension and supplement. The lead example in the Times story was a former Ventura County chief executive, Marty Robinson, who was earning $228,000 a year and retired in 2011 with an annual pension of $272,000. “Robinson cashed out nearly $34,000 in unused vacation pay, an $11,000 bonus for having earned a graduate degree and more than $24,000 in extra pension benefits the county owed her,” said the Times. Backers of the initiative filed this month say the growing cost of pensions is taking 17 percent of the Ventura County budget and eating up money needed for parks, libraries and hiring more deputy sheriffs. McDermott said the initiative drive was launched after eight years of failed attempts to get unions and elected officials to cut pension costs. He signed the initiative petition filed Jan. 16 along with Richard Thompson and David Grau. All three are members of the Ventura County Taxpayers Association. A separate group was formed for the initiative campaign. The signatures of 26,000 registered voters are needed by May 16 to place the initiative on the November ballot. The initiative is similar to an initiative approved by 66 percent of San Diego voters in June 2012 that switched new hires to 401(k)-style individual investment plans and called for a five-year freeze on pay used to calculate pensions. The San Diego initiative exempted police from the switch to a 401(k)-style plan, allowing them to continue receiving pensions. The Ventura County initiative would switch all new hires to 401(k)-style plans, including the sheriff and the deputies. “If you want to make a material change you have to include safety, because there is a significant amount of the cost included in their pensions,” McDermott said last week. McDermott said the initiative backers “respect the service” of deputies and do not want a “B team” of the less qualified. If a county contribution of 11 percent of pay to the 401(k)-style plan is not attractive enough, he said, salaries can be raised. The initiative limits the county contribution to 11 percent of pay for safety employees not in Social Security, 5 percent of pay for safety employees enrolled in Social Security and 4 percent for other employees with Social Security. Most private-sector employers have switched to tax-deferred 401(k) individual investment plans that avoid long-term debt, have no hidden or ballooning costs and can be moved by employees if they leave the job. Critics say 401(k) plans shift risk from employers to employees, tend to have investments poorly managed by employees, were intended to supplement not replace pensions and often do not provide adequate funds for retirement. The “Ventura decision” may have been enabled two decades ago. CalPERS sponsored anti-spiking legislation for its members, SB 53 in 1993, that created a screening unit and made it more difficult to manipulate final pay to boost pensions. A similar bill for the 1937 act counties, SB 2003 in 1994, cleared the Senate but died in the Assembly. The state Supreme Court “Ventura decision” in 1997 was unanimous, even though labor agreements reportedly had said additional pay would not count toward pensions. The courts later ruled the “Ventura decision” was retroactive, boosting pensions of those already retired. Unlike CalPERS and CalSTRS, seven county systems refused to release the names and pension amounts of retirees until ordered by the courts. An anti-spiking provision in Gov. Brown’s pension reform legislation limited special pay that can be counted toward county pensions. Union lawsuits challenging the reform were filed in Alameda, Contra Costa, Marin and Merced counties. Contra Costa Superior Court Judge David Flinn issued a preliminary ruling last month in the consolidated Alameda, Contra Costa and Merced suits. He set a hearing Feb. 11 on arguments and modifications submitted by the parties. This entry was posted on January 27, 2014 at 8:23 am and is filed under Local, Reforms, Spiking, Ventura County. You can follow any responses to this entry through the RSS 2.0 feed. You can skip to the end and leave a response. Pinging is currently not allowed. All they will get for new employees, if any, are those who cannot get hired anywhere else because of background issues. Good luck Ventura County, you are going to need it. You can take a pig out of the pig-pen, but a pig will always be a pig. All of this supports Bankruptcy (for Counties and Cities and Special Districts) and/or Sovereign Default (for the State). Otherwise the Courts find that these amazingly high pensions are guaranteed by contract law. These limits are in line with what I’ve suggested. However, they buy more retirement income if put into a DB plan, due to lower fees and the elimination of mortality risk. There should be a requirement that no management fee shall exceed a maximum value of, say 0.05% for any investment sub fund, and never more than 0.025% overall. DC plans have terrible records of grabs of huge sums via the fees. It is inaccurate to say `shift risk from employers to employees’. Pooling in DB plans *eliminates* mortality risk. Risk is not a `conserved quantity’; you can remove it, not just shift it. In fact, the mismanagement of California’s DB plans came not from Risk issues , but from increases in pension benefits to eat the ephemeral 1999-era gains… that risk was totally unnecessary, but in America, `greed is good’ and led to the unwarranted 1999-era (and other) increases. The egregious examples were individuals in management who bargained for themselves. The CalPERS pension plan and the County Plans that are administered via the 1937 County Act are horses of a different color. Articles regarding the thousands of public employees in CA who are former rank and file and receive modest pension amounts are the norm–of course nobody would read an article about the norm. Poor TL, would have to find a different hobby. Defined contributions don’t require individual 401(k)s. The point is to have the compensation of employees known and paid in the present, something that is impossible and fraught with potential mischief with defined benefit pensions. Pooling assets and sharing risk in retirement investment is better than individuals managing their own and being subject to large variations in returns and hence pensions received. Many public employers, like my former municipal employer, provide a DC, 457 plan for government workers. I saved in my 457, like a madman. The payouts, now that I am retired, buy the groceries, but I would not have come near to be able to fund my total retirement needs with the 457–the best thing is a DB plan with an employer-sponsored DC plan to supplement it. To expect individual public employees to administer their own DC plans would be folly–most would end up in Social Services. Or they could end up like my spouse, with a blue-collar DB pension that doesn’t cover the cost of the medical insurance premium. TL’s idea that public employee pensions should be brought down to the level of the sparse DB pensions left in the private sector emanates from pure envy. How about working to raise the private sector up to the level of the public sector, by reinstating the DB pension systems that used to exist! And, a note to the voters in Ventura county: You might take a moment to consider how you would feel if your employer was trying to pull the rug out from under you when it comes to your old-age stability. You also might consider that, whether you are still here or gone, in the future, you could have grandchildren and greats down the line, who would benefit from stable DB pension plans. This may be an egregious example, or it may be just an extreme example. At the risk of bringing the wrath of TL upon my shoulders, local governments often go into arrangements like this with eyes wide open, in arrangements similar to stock options or golden parachutes for private sector executives. You know it’s not just a fluke, because the county even has to go into complex work arounds to legally comply with IRS maximum allowable pension rules ($115,000 max, last I heard). But cities and counties often do this to get QUALIFIED top executives. It’s not uncommon for California cities to pay over $200,000 a year for a competitive city manager, with housing, car, insurance, and contract guarantees on top. And the cities often feel it is money well spent. It can be a win/win for the employer AND the taxpayer. A good manager can SAVE the city more than his salary costs them. How much is a good sheriff worth? As Mike Genest is reported saying, “we could have made MORE on the outside. I am as pro labor as anybody but–I too assume these are outliers and examples by bad actors– I agree it’s bad– Brown’s pension reform ends this. Govt employees like the rest of us have to save, save, save. cut back the cable TV, and the Doritos. You don t need a 3000 ft. five bedroom house for you and 1.3 kids. You don t need to park your spreading posterior on the couch and watch basketball games…saves on those medical premiums as you get older. LIve within your means and save, save. The average cost for Vallejo safety employees is approaching 250K. Who has that, Mawinda? I live in a 50’s era tract house with property taxes that are $500/yr. Ed Towner’s right, Brown’s PEPRA includes a cap. Pensionable salary cannot exceed the Social Security limit (about $114k). PEPRA also prohibits calculating pensions on vacation, uniform allowances, etc. New cops hired today, who become chiefs tomorrow, will not get $200k-plus pensions. Pension reductions must apply to the FUTURE service of CURRENT workers to have any MEANINGFUL financial impact. Change only applicable to NEW workers are financially meaningless. Financially meaningless? The current changes are applicable to all workers in some way. They all have to start paying more of their own gross pay to fund their pensions; there will be no more retroactive formula enhancements. Governments all over CA started their own pension reforms prior to PEPRA and are saving money. You need to mind your own business, TL–New Jersey needs your meddling more than CA does. – Your argument is false. The cost of pensions are increasing at a very rapid and alarming rate. Main purpose of Ventura County government is too stuff the pockets of public employees with taxpayer money…it goes on night and day….then they retire….